SINDHUPALCHOWK, March 20: Sindhupalchowk, one of the worst-hit districts by the devastating earthquakes of 2015, has expedited the reconstruction work since the National Reconstruction Authority (NRA) fixed the deadline for receiving the second tranche of relief. People living in eastern to western parts of the district have been involved in rebuilding their houses by putting aside all other works. The villages which were reduced to rubble by the ravaging earthquake have finally started taking shape again. Quake victims have finally started gearing up to move to their own houses from makeshift tents. It seems like they might finish building their houses by July. 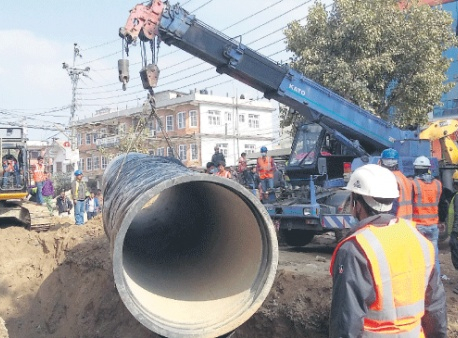 “Quake victims are enthusiastically involved in reconstruction," said Chief of Urban Development and Building Division, District Project Implementation Unit (DPIU) Tanka Gautam. According to him, more than 56,000 houses are under construction in the district at the moment. Gautam, who is also a division engineer, informed that around 150,000 workers are deployed in the district per day for reconstruction. At least four to five workers are deployed in each house. But many are also working by doing labor exchange. This has helped them reduce financial burden to a great extent. As the victims are making their days and nights together for building their houses, they hardly have time for anything else. NRA has urged the victims to collect their second grant before May. As per the details provided by DPIU, until mid- January, as many as 50,000 victims had started building their houses but 7,000 more people were added after the NRA fixed the deadline to collect second installment of grant. Victims can receive the second tranche only after laying the foundation of their houses. According to DPIU, more than 11,000 victims have built their houses on their own without waiting for the government relief. But some government officials refuse to accept this data as they think the number is higher than this. More than 51,000 victims have been provided with the second tranche of relief. Reportedly, the division had provided masonry and other trainings to around 9,000 locals in coordination with other organizations. Earlier, reconstruction was stalled due to lack of manpower and construction materials but that problem has been solved now. A large number of workers were hired from different parts of the country and also from India. "Reconstruction has employed a large number of people in and outside of the district," claims Gautam.